The Ambrosia Apple A Day Contest closed on March 15th, 2019 and our judges went to work in selecting their favourite photo. For the past few months, Ambrosia apple fans have been sharing pictures of Ambrosia apples in various different scenarios. For some, it was all about eating an Ambrosia while others took the opportunity to share Ambrosia apples with their favourite pet, person, or place. Throughout the contest, the photos were voted on by the public. There were over 10,000 votes! Our judges took these votes into consideration as they deliberated. In the end, there was one photo that rose to the top. 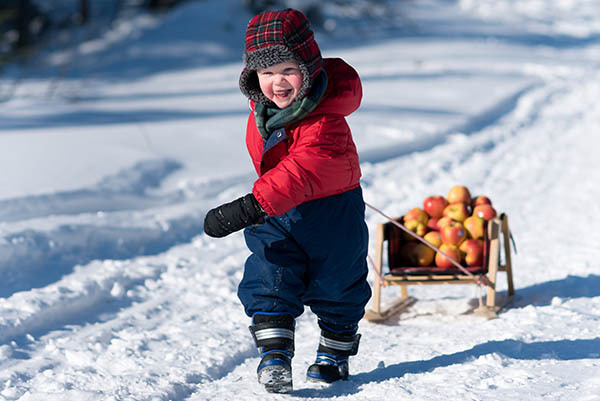 The photo depicts a quintessentially Canadian winter scene – a bundled up toddler pulling a wooden sleigh filled with Ambrosia apples. One can’t help but smile looking at the joy on the little one’s face and the determination in his ambitious stride. While the photographer titles it ‘Ambrosia Delivery’, we’re inclined to the wonder if in fact, it’s a mischievous child making off with a load of delicious Ambrosia! It certainly captures the imagination and it captured our Judges’ hearts. Congratulations to Stirling McIntosh from Thunder Bay, Ontario for his winning photo. Thanks to our sponsors for their generous contributions to the prize and for supporting local farmers. Thanks to our judges, Adrian Arts, Natalina Arauja, and Railou Gill for taking the time to consider every image carefully. And a great big thanks to all of you Ambrosia fans who voted and submitted contest entries. Your photos were fantastic and we loved every single one of them.